A native New Yorker, Kevin Kopelson attended both Bronx High School of Science and The Juilliard School. He majored in music at Yale (graduating at age nineteen) and then got a law degree from Columbia (at twenty-two). After practicing law, he got a doctorate in English Literature from Brown (at thirty-one). Much to his surprise, he’s been in Iowa ever since—teaching “critical theory” at a university there and also, unlike some even older colleagues, writing books (Love’s Litany , Beethoven’s Kiss , The Queer Afterlife of Vaslav Nijinsky , Neatness Counts , and Sedaris ). Much to his surprise, he’s now fifty-two. from David Wilder: A delicate mix of striptease, truthiness, conceptual ownership, and semiotic bliss. 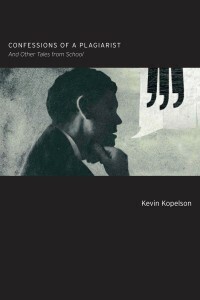 LitBridge lists Kevin Kopelson’s Confessions of a Plagiarist (Counterpath 2012) as a top nonfiction title….